American Architecture is a superb and almost definitive selection of American urban imagery in postcard form compiled by an architectural historian with an excellent eye for an arresting image – a book that can sustain hours of browsing. Leonard Pitts’ collection of Parisian postcards is unequalled in its scope and distinction and well presented in this book. Pitt is an exemplary scrutineer of postcards and draws out the hidden narratives with skill. He is especially good at locating the telling detail or the concealed discrepancy. 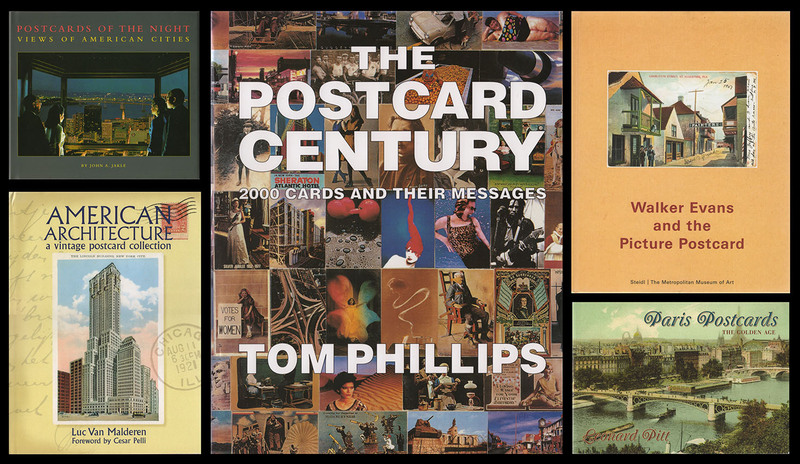 More than any other anthologiser of postcards, Tom Phillips delves deep into the mysteries of the subject. This survey is like a geologist’s core sample retrieved from a century’s accumulation of ephemera. The Postcard Century is a heroic compilation of all the finest qualities that postcards possess and evidence of a massive commitment in terms of time and resources. The book displays a year-by-year selection that crosses virtually all genres and categories and is greatly enriched by the correspondence that the author has transcribed from the reverse and adds greatly to the social documentary feel of the enterprise. It is quite simply a humane and fascinating book that can be opened at any page and the reader is instantly immersed in a chronicle of lost times. The visual images and the transcribed text are mutually enhancing and add up to a lot more than the sum of their parts. Postcards of the Night is a worthy attempt to do justice to a minor genre with an unusual capacity to emotionally engage the viewer. John Jakle is a keen-eyed observer of the dubious art of photo-retouching and gently draws attention to the scale of manipulation to be found in these images. Above all he is receptive to the visual poetry and sense of enchantment embedded in this most unlikely of places. The Walker Evans book is best considered as a tribute to the most visually sophisticated collector of vintage postcards. While his contemporaries were in pursuit of the rare and hard to find, Evans, the great American photographer, went looking for images that enhance our appreciation of the everyday and unremarkable – visual clues to the texture and flavour of the things most quickly forgotten or dismissed as trivial and insignificant. By the time he died in 1975 he had amassed a collection of 9,000 examples divided into subject categories such as Small Towns, Summer Hotels, Railroad Stations and as Jeff Rosenheim points out (Unclassified: a Walker Evans Anthology, 2000), almost all of Evans’s photographic output could be fitted into the filing system he devised for his postcards. Evans began collecting at the age of 10 and continued all his life, even delivering illustrated lectures on the subject at Yale University and the Museum of Modern Art, New York. Evans was attracted by the emotional neutrality of postcards, preferring those that recorded the everyday and ordinary to those that strove for conscious effect or those that celebrated greatness in architecture, history or human achievement. He used his privileged position as a Contributing Editor at Fortune magazine and Architectural Forum to indulge his obsession and present his most cherished examples to a wider readership. Books written with the needs of collectors in mind are mostly to be avoided unless they are directly relevant to your interests and there are many dismal anthologies of local interest postcards dedicated to specific places that with a few exceptions make unrewarding reading. The list below includes some that have been informative and others that offer some entertainment.